Sly Stone is on the move again. 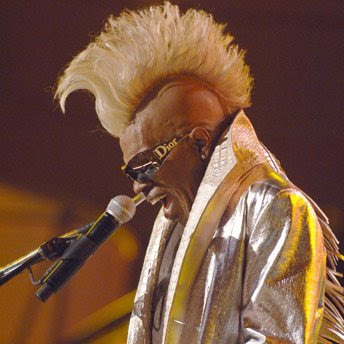 The funk rock fox has teamed with Funkmeister George Clinton and El Debarge for a new song. There is also a new book: "Sly: The Lives of Sylvester Stewart and Sly Stone," by music industry veteran Eddie Santiago. Seems Sylvester Stewart is having quite a time since last year's successful world tour. Come back? He already came back. Now he is back. Or so it appears. "The first new track from Sly Stone in years is a cover of Marvin Gaye's classic "Ain't That Peculiar" that appears on George Clinton's new album Gangsters of Love. The track features El DeBarge supplying a velvety smooth lead vocal that contrasts sharply with gruff ad-libs by Sly that are relayed through a vocoder - a favorite device of Sly's that he has used on stage in his recent appearances. Like Sly, DeBarge is returning to recording after being sidelined with drug addiction and other problems." Now if only the Magnificient 7 (Sly & the Family Stone) could just check their egos, coordinate their schedules and redeliver the funk rock, the universe would be back in alignment. Having just read Eddie Santiago's book though, I am not encouraged. A lot of mud went down and it is probably humanly impossible for humans to clean those sheets and make music together again.